Monaco Tire & Auto Offers Auto Repair Services You Can Count On! 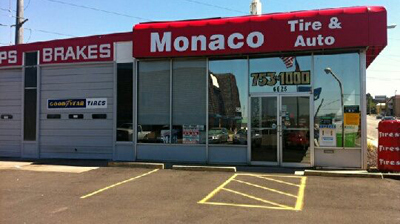 Since 2004, Monaco Tire & Auto has provided motorists in the Denver, CO 80224 area with comprehensive auto repair services that include Brakes, Car & Truck Care, Electrical Services, Electronic Services, Engine & Transmission, Engine Maintenance, General Services, Heating and Cooling Services, Ignition Interlock Systems , Inspections and Emissions, Miscellaneous Services, Quick Lube Services, Tires, Towing and Undercar Services. Our goal is to offer the best services available at affordable prices to get you back on the road in no time. For a high-performing vehicle, trust Monaco Tire & Auto with your car, truck, or van. To learn more about the services we offer, please contact us by phone at 303-753-1000 or send us an email. We also invite you to learn more about our dedication to you, our valued customer. I had a screw in my tire and I was running late for an appointment early Saturday morning. Dino and the team were friendly accommodating and fast - had me on the road in just 30 minutes. I'll definitely return for tires and alignment. Great place to take your car for repair, excellent customer service. Fantastic group of people who are committed to helping you out! I had a rock stuck in my exhaust area but it sounded like much worse of a problem. I was from out of town and was so thankful to have found these guys! They even saved the rock for me - no charge. Great place and good people! Very friendly and gave me a great deal ! Local shops are the best ! I had a knocking sound in my front end. Dino the owner was more than helpful. He spent 30 minutes diagnosing and fixing the issue. In the end, he didn't charge me a dime, even though I offered to pay for his time. I'll be buying all of my tires and service here from now on. Thanks Dino!!! This was my first time using this establishment - OUTSTANDING! They are quick, thorough, reasonably priced, professional and caring. They were very understanding and helpful in working with my work schedule and bank payment due to the large amount. Such a great place to take your ride for service..they are nice, fast and very ethical.. Deano as well as well as any of his employees that i have ever dealt with are all stand up guys..give em a shot you wont be disappointed. This place is VERY nice and they are extremely helpful for car work. I can't say it's the cheapest but it is not over priced and still cheaper than normal car dealers. I have an engine replaced for my car and they were very fast and quick about it as well as making sure I was staying up to date in additional problems they found and costs that might be added if I wanted them addressed as well. I even got a free oil change for coming back later since I had previous work done. Was not expecting that. This place is excellent and I highly recommend it.